Those familiar with the Mike Leigh process know that it rarely produces a film that is anything less than stellar. Leigh thinks of a basic idea, gets a group of actors together (that he’s most likely worked with before), and sits them down in a room for weeks on end, improvising different scenes for his would-be film. The characters come first, the story is secondary. The improvisations are done in full costume and makeup and often on location. Leigh takes notes during this period, and when they are finally set to film, the actors are simply reminded what they said and learned during their weeks of improv. But here’s the kicker: Leigh keeps character motivations from everyone on set, except the person playing that character. So when Vera Drake’s family discovers that she was arrested for completing a series of illegal abortions, the characters, and the actors playing them, are hearing it for the first time. Every reaction on camera is real. It’s a unique process, one that has produced several of the best films of the past two decades including Secrets & Lies, All or Nothing, Vera Drake, and Happy-Go-Lucky. Leigh’s films have a delicate melancholy to them. Sometimes little action is occurring on screen simply because not every moment in life is terribly fascinating. Leigh, I suspect, is captivated by the mundane. 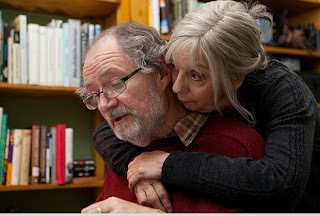 Take Gerri and Tom (played by Leigh vets Ruth Sheen and Jim Broadbent), the happily married couple who act as the foundation for Leigh’s new insightful film Another Year. The film tracks four seasons with Gerri and Tom; throwing dinner parties, dealing with troubled friends, encouraging their polite but relationship challenged son, and so on. One could make an argument that nothing really happens in a Mike Leigh film. I completely agree, Another Year feels like Leigh hid a few cameras in a home, taped for a year, then edited the parts that he felt added scope and depth to his characters. In short, you won’t get reality like you get in a Mike Leigh film. Nice and solid review sir! I remember the first Leigh film I watched was Nuts In May, a film I had heard and read nothing but praise for, and I wound up absolutely hating it. I just thought it was one of the most annoying films I had ever seen. It took a long while before I even thought of watching another Leigh film and when I did I watched Naked and was absolutely blown away by it! It was dark and funny and intense and just amazing! Since then I have yet to find another Leigh film that I dislike. This is one I haven't gotten to yet but definitely need to. Thanks man! Naked is my favorite Leigh film - so stark and brutal. Another Year is almost the antithesis to it, kind and open. It still has its moments of harshness, but nothing compares to Naked. I mean... wow.